The works in this exhibition will explore notions of beauty, romanticism, and decorative arts. 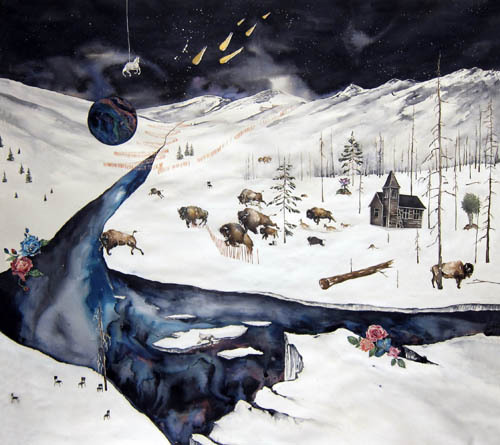 Through watercolour painting, narratives appear that examine social rituals, perceptions of place, and occupy the liminal world between fantasy and reality. The paintings are informed by iconography that represents centuries of accumulated tradition and belief. These historical references are butted up against objects from contemporary life. Everyday objects are elevated to iconographic status or alternatively reduced to a kind of ornamentation. In some works, the lack of perspective and the deliberate shifts in scale – which can often be found in medieval painting, tapestries or even contemporary textile patterns – serve as a reordering of iconography and a re-telling of landscape and narrative. Representations – old and new – are then organized and reorganized to create new iconography; a new mythology. I am fascinated by the perceptions of kitsch – frivolous and relatively meaningless but at another time, highly valued. Likewise idols and sacred symbols can be highly worshiped but then fall from their grace. By pushing the materiality of these works, I add another of layer. In my main medium, watercolour, I experiment with the addition of irridescent paints and gold leaf to begin a dialogue between media and subject. ROSEMARY SCANLON, completed her Master’s of Fine Arts degree from Glasgow School of Art in 2010, and holds a BFA from Concordia University in Montreal. Scanlon has participated in exhibitions at the Lesher Centre for the Arts (California), Centre for Contemporary Art (Glasgow), the Künstlerhaus Bethanien (Berlin), Galerie Division (Montreal), the Ottawa Art Gallery (Ottawa), and aceart.inc (Winnipeg). Her work has recently been presented in a solo exhibition at the Yukon Art Centre in Whitehorse, YT. Scanlon is a two-time recipient of the Yukon Government Advanced Artist Award, a two-time recipient of the Yukon Government Travel Grant, a recipient of the Canada Council Travel Grant and a two-time recipient of the Elizabeth T. Greenshields Memorial Grant.